Two variations here for a homemade pastrami recipe in terms of the cure ingredients but what is common to all pastrami recipes is that for pastrami to be pastrami, it has to be smoked. Pastrami was created by the Slavic Jews who adapted a Romanian pork recipe called Pastrama and used beef instead and it became very popular in Jewish delicatessens. With mass migration many Jews moved into the United States and of course they took pastrami with them and what's there not to like? Pastrami is beef that has been cured, seasoned and smoked. The cuts of meat used are the inexpensive ones like brisket or shoulder so for us smoking enthusiasts it's got to be right up our street. 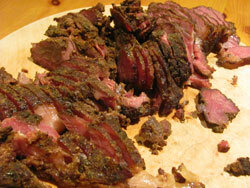 The picture above shows you the hot smoked version that I made using an "unrolled" piece of brisket. It worked extremely well although maybe a thicker piece of meat would have helped make for larger slices - a lesson for next time. 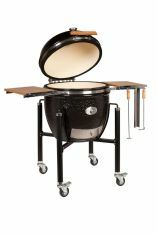 I've detailed two ways to do it, one is hot smoker and this is certainly the easiest way, the other is by cold smoking. The cold smoking method is a much more long and drawn out process but maybe for the purist, this is the one for you? Note that pastrami is cured for 6 days before the smoking too so don't expect to have this recipe cracked off in the weekend – you need to plan one weekend in advance. In both of these rubs below, there's enough mix to do about 1ib of beef. Just mix thoroughly and your rub is ready to use. Note in the picture above how I've used the cans of soda just to add some weight during the cure, this is just to make sure that everything stays compact and as much of the rub as possible remains in contact with the meat. Put brisket with all the other ingredients (except the black pepper) into a resealable polythene bag and mix them up thoroughly. Put the bag into the fridge for 6 days, turning and shaking the bag several times a day. When the curing process is finished, rinse each piece of meat well and dab dry with a paper towel. The next stage is to roll the meat in the coarsely ground black pepper and then wrap each piece in a paper towel and refrigerate overnight (remove the paper towel before cooking). Water smoke at 240°F (115°C) for 5 hours or until the internal temperature reaches 170°F (77°C). Once complete, allow to cool, slice thinly and enjoy. It's that simple. Hand the pieces of meat in your smoker and dry (no smoke) for an hour at 60°C or 140°F - you'll find that when the hour is up, your meat is noticeably dry on the outside. Cold smoke for 3 or 4 hours at 30°C or 85°F and then finish off with one or two hours at 63°C or 145°F dependent how dark you want your meat. Cold smoking is the first stage now you need to cook the meat. I've two alternatives for this stage of the process. The first cooking method is in water and the second is in the oven. Wrap the hunks of meat in stretch wrap, place each one individually in a resealable plastic bag and squeeze as much air out as possible before sealing the bag. Place the bags in a pan of water that is at 93°C or 200°F for 2–3 hours taking care to ensure that the water doesn't boil because this will cause the meat to dry out excessively. 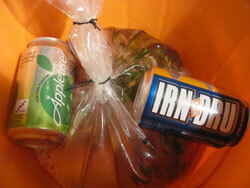 When cooked, remove from the plastic and allow to cool. Wrap the pieces of pastrami in foil and place in an oven at 110°C or 225°F more or less as low a temperature as your oven will run. Cook until the internal temperature reaches 77°C or 170°F and then remove from the oven and allow to cool. I just can't resist a hot pastrami sandwich so I always find that I'm eating it before I should. Technically it should be allowed to cool and then refrigerated. The pastrami will keep in the refrigerator for about a week so if you've made a big batch, the remainder should be frozen.